Recently, a paper described Eastern Scythian groups as “Uralic-Altaic” just because of the appearance of haplogroup N in two Pazyryk samples. This simplistic identification is contested by the varied haplogroups found in early Altaic groups, by the early link of Cimmerians with the expansion of hg. 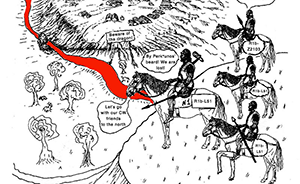 N and Q, by the link of N1c-L392 in north-eastern Europe with Palaeo-Laplandic, and now (paradoxically) by the clear link between early Mongolic expansion and N1c-L392 subclades. 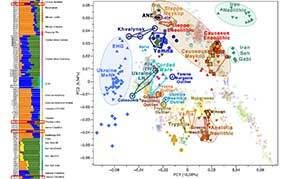 Genetic kinship and admixture in Iron Age Scytho-Siberians, by Mary et al. Human Genetics (2019). From an archeological and historical point of view, the term “Scythians” refers to Iron Age nomadic or seminomadic populations characterized by the presence of three types of artifacts in male burials: typical weapons, specific horse harnesses and items decorated in the so-called “Animal Style”. This complex of goods has been termed the “Scythian triad” and was considered to be characteristic of nomadic groups belonging to the “Scythian World” (Yablonsky 2001). This “Scythian World” includes both the Classic (or European) Scythians from the North Pontic region (7th–3th century BC) and the Southern Siberian (or Asian) populations of the Scythian period (also called Scytho-Siberians). 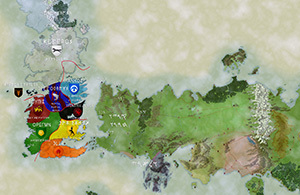 These include, among others, the Sakas from Kazakhstan, the Tagar population from the Minusinsk Basin (Republic of Khakassia), the Aldy-Bel population from Tuva (Russian Federation) and the Pazyryk and Sagly cultures from the Altai Mountains. In this work, we first aim to address the question of the familial and social organization of Scytho-Siberian groups by studying the genetic relationship of 29 individuals from the Aldy-Bel and Sagly cultures using autosomal STRs. (…) were obtained from 5 archeological sites located in the valley of the Eerbek river in Tuva Republic, Russia (Fig. 1). All the mounds of this archeological site were excavated but DNA samples were not collected from all of them. 14C dates mainly fall within the Hallstatt radiocarbon calibration plateau (ca. 800–400 cal BC) where the chronological resolution is poor. Only one date falls on an earlier segment of calibration curve: Le 9817–2650 ± 25 BP, i.e. 843–792 cal BC with a probability of 94.3% (using the OxCal v4.3.2 program). This sample (Bai-Dag 8, Kurgan 1, grave 10) is not from one of the graves studied but was used to date the kurgan as a whole. Y-chromosome haplogroups were first assigned using the ISOGG 2018 nomenclature. In order to improve the precision of haplogroup definition, we also analyzed a set of Y-chromosome SNP (Supplementary Table 2). Nine samples belonged to the R1a-M513 haplogroup (defined by marker M513) and two of these nine samples were characterized as belonging to the R1a1a1b2-Z93 haplogroup or one of its subclades. Six samples belonged to the Q1b1a-L54 haplogroup and five of these six samples belonged to the Q1b1a3-L330 subclade. 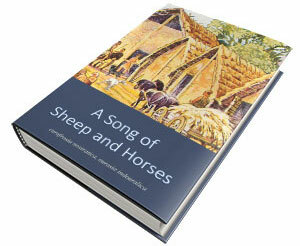 One sample belonged to the N-M231 haplogroup. The distribution of these haplogroups in the population must be confronted with the prevalence of kinship among the samples. Although five individuals belonged to haplogroup Q1b1a3-L330, three of them (ARZ-T18, ARZ-T19 and ARZ-T20) were paternally related (Fig. 2). It must, therefore, be considered that haplogroup Q1b1a3-L330 is present in three independent instances (given that the remaining two instances exhibit no close familial relationship with other samples or one another). All five were buried on the Eki-Ottug 1 archaeological site (although in two different kurgans). In the same way, although two groups, of two and three individuals, shared haplotypes belonging to the R1a-M513 haplogroup, these groups likely include a father/son pair (ARZ-T2 and ARZ-T12). Therefore, among nine R1a-M513 men, we found six independent haplotypes, one being present in two independent instances. 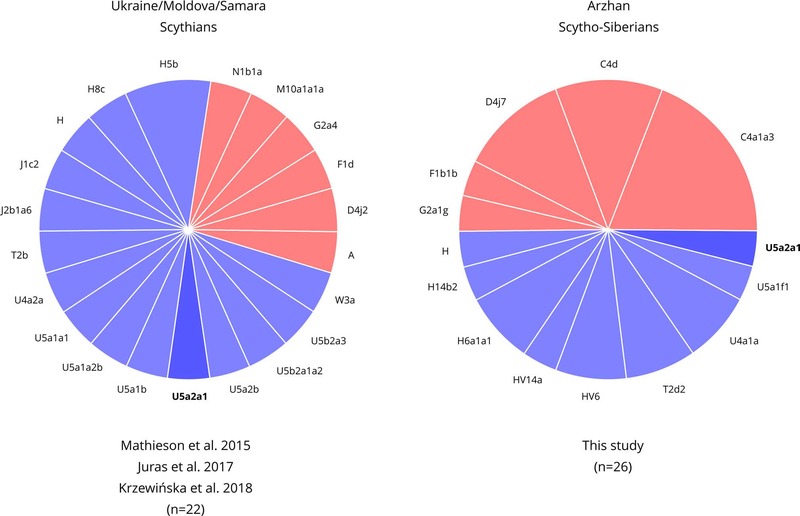 All R1a-M513 haplotypes, however, including those attributed to the R1a1a1b2-Z93 subclade, only differed by one-step mutations, across 5 loci at most. All R1a-M513 individuals were buried on the same site, Eki-Ottug 2, in a single Kurgan. Haplogroup R1a-M173 was previously reported for 6 Scytho-Siberian individuals from the Tagar culture (Keyser et al. 2009) and one Altaian Scytho-Siberian from the Sebÿstei site (Ricaut et al. 2004a), whereas haplogroup R1a1a1b2-Z93 (or R1a1a1b-S224) was described for one Scythian from Samara (Mathieson et al. 2015) and two Scytho-Siberians from Berel and the Tuva Republic (Unterländer et al. 2017). 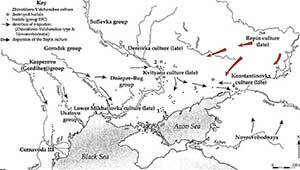 On the contrary, North Pontic Scythians were found to belong to the R1b1a1a2 haplogroup (Krzewińska et al. 2018), showing a distinction between the two groups of Scythians. 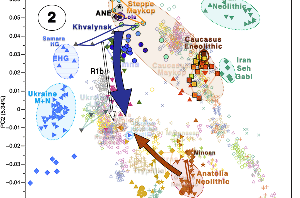 (…) The absence of R1b lineages in the Scytho-Siberian individuals tested so far and their presence in the North Pontic Scythians suggest that these 2 groups had a completely different paternal lineage makeup with nearly no gene flow from male carriers between them. 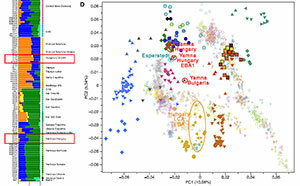 The seven other male individuals studied in this work were found to carry Eastern Eurasian Y haplogroups Q1b1a and one of its subclades (n = 6) and N (n = 1). 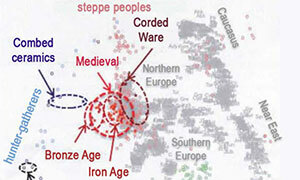 Haplogroup Q1b1a-L54 was previously described in four males from the Bronze Age in the Altai Mountains (Hollard et al. 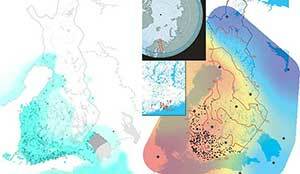 2014, 2018) and was clearly associated with Siberian populations (Regueiro et al. 2013). The N-M231 haplogroup emerged from haplogroup K in Southern Asia around 21,000 years BCE, maybe in Southern China (Shi et al. 2013; Ilumäe et al. 2016). Previous studies attested to its presence in samples from Neolithic and Bronze Age in China (Li et al. 2011; Cui et al. 2013). Waves of northwestern expansion of this haplogroup are described as beginning during the Paleolithic period (Derenko et al. 2006; Shi et al. 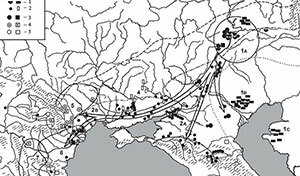 2013) but traces of this expansion in archeological samples were reported only in two Scytho-Siberian males from the Altai (Pilipenko et al. 2015). The sample of haplogroup N comes from the Aldy-Bel culture (ARZ-T15), from the Eerbek site, but has no radiocarbon date. All Q1b-L330 samples come from the Sagly culture, and three are paternally related. 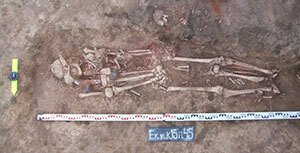 The other Q1b-L54 sample is from other tombs in one kurgan at Aldy Bel.